You can use the Stone of Luck spell for anything, love, money, health, wealth, spirit awareness, etc. The key to this empowerment is concentration and belief. When you have completed this spell, carry the stone around with you. Eventually you will start to get what you want. First you need to meditate on what you want, be it money, love, better health….whatever you want. After you feel you have meditated long enough, you may start the spell. Light the candle and incense. (Be sure you have all of the things you need with you.) Hold the rock in your power hand. Concentrate on what you want. Run the rock through the flame 3 times. Then put it into the water. Cup your hands over the bowl. Then take the rock out of the water and sprinkle the herbs on it. After you have done that, put the rock into a dry bowl. Visualize yourself getting what you want. Then anoint the rock with the oil and put the rock back into the dry bowl. Sprinkle some salt onto the rock. Concentrate more. Then wrap the rock in the cloth and leave it for at least 24 hours. Let the candle and incense burn all the way out. Dispose of the water. After citing the magickal incantation, gentle shake the jar a few times and then kiss it before putting it back. Mix the cinnamon with dirt from your footprint, sprinkle it along the path entering your home to attract luck and fortune towards yourself and your home. Face a mirror and think of all the misfortune that has befallen you since breaking the mirror. Think of how those things could have gone better, and then clasp your hands together and shut your eyes tight. Beg Fortuna or another luck deity for forgiveness, and tell her that you never meant to break a mirror or cause her any trouble. Kneel on the floor in front of the mirror and beg for her blessing so that your life may return to normal. When you are finished speaking with Fortuna or your luck deity, thank them for their time, kiss the mirror, stand up, and turn to the right and walk away starting with your right foot. Try not to break another mirror anytime soon! Forever fortune bring to me. By this poppet, close I’ll stay. Fortune bright find me today! Add a small citrine to the pouch and you have a powerful sachet. During the full moon, put the bag together, then consecrate and charge it. Make certain it is tied tightly. Keep it close to your heart. 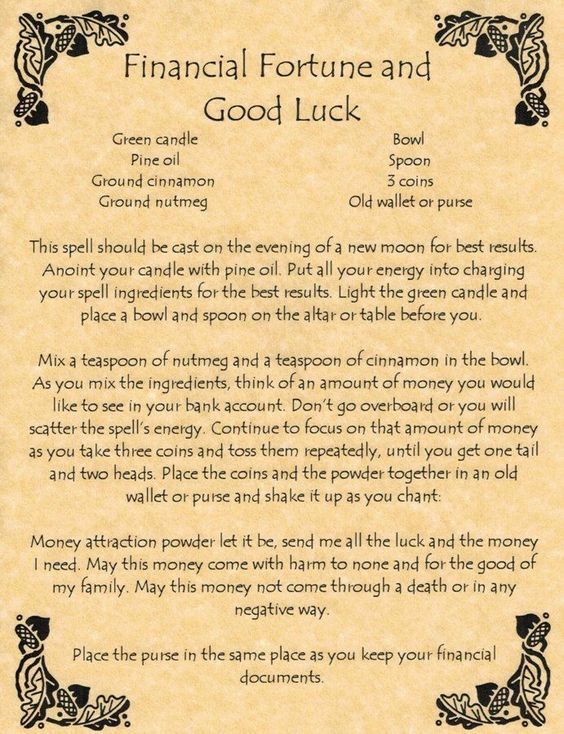 Posted on May 13, 2015 by ladyoftheabyssPosted in Luck SpellsTagged Angelica Root, Fennel seed, Holy Thistle, Magic, Magick, Pagan, Stop Bad Luck, Wicca, Witch, Witchcraft. And all will turn out well. You could put a pinch of this mixture into a charm bag, or seal a tablespoon of it inside an envelope and keep it in your bill drawer or the bottom of your purse to promote prosperity. Or just sprinkle a spoonful on your buttered toast in the morning to add prosperity and success to your day. Blessed be! So shall it be!